Between the second and third days of production we had a bit of a gap. Day Two was November 22nd 2014 and Day Three was January 17th 2015. We had the gap for a few reasons. First, was the holidays. That always causes havoc with scheduling, but it’s a particular hurdle when doing something on no budget. We took advantage of this gap in shooting to bring some new people on board and get some logistics worked out. During the gap Nicole Solomon joined the production as our Art Director. We needed someone to get our locations looking like what I had in mind for who these characters are and what kind of spaces they live in. Nicole was our person to do that. Nicole and I met when I AD’d a film for one of her classmates from film school early in 2014. She had been Art Director on that film. Then, we met again freelancing for the same Not-for-Profit. Then, I helped her with a shoot she had in December. Nicole put a lot of work into helping me bring the look of Meme together in front of the camera. 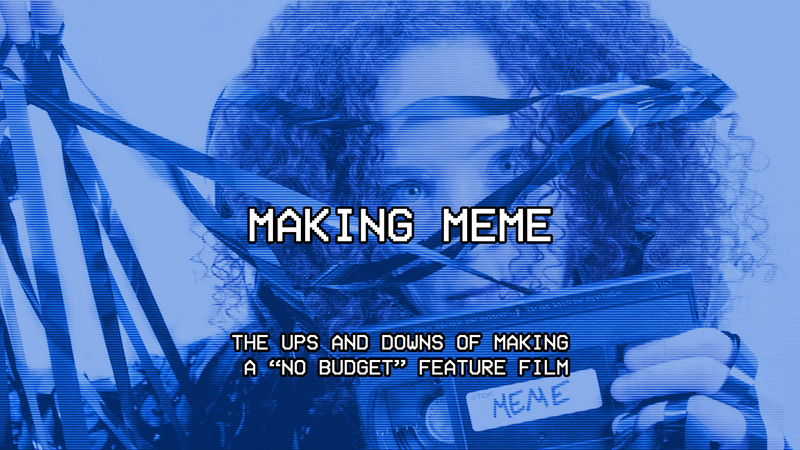 She subsequently helped me Produce the film-within-a-film for Meme, Beneath the Black Moon, and has since become my business partner in 4MileCircus. In addition to Nicole, Chaz H. Cleveland came on board as Kyle, a character I was having a lot of trouble casting, and Rory Lipede came on as Jennifer’s friend Lesley’s wife Andrea. Chaz I met on Nicole’s shoot in December. He was there to play an extra in a scene at the beach at Coney Island. He had shown up early and I chatted with him a bit as we were preparing to shoot and I quite liked him. Chaz is not an actor but he has a charm about him and by the end of the day I’d gotten it into my head that he could play Kyle and couldn’t let that go. He just felt like the kind of person I wanted Kyle to be. Not being an actor when I brought this up with my Producer Carolyn Maher she suggested that we needed to get him to do a taped audition at least, so that we could see how he played on camera. It was exactly what I’d hoped, he felt natural, and we cast him as Kyle. It can be a risk working with non-actors. You don’t always know how people are going to do when the camera rolls. Can they feel natural while being unnatural? That’s one of the fundamental skills of being an actor. We were fortunate that Chaz was. Part of that was also how I approached directing him. I gave him the same kind of notes ahead of shoot days as I would give the other actors. On set he would ask if he could change up a line from time to time. Nothing major. Still saying more or less the same thing. He just wanted to say it in a way that felt more natural for him. I usually said yes after he told me how he thought he should say it. Not that I was very strict with everyone else and their lines or variations on lines, but I may have given him some more wiggle room, in the hopes that his less practiced approach would make him feel more comfortable and he would give a more natural performance. I think this worked out well in the final film. Lauren A. Kennedy and Rory Lipede in Lesley and Andrea’s wedding photo, which appears as set dressing in shots in their apartment. Rory came to us through the usual casting channels. I’d created Andrea admittedly late in the writing process. Lesley was essentially a woman living on her own in Brooklyn for many drafts of the script and it was feeling a bit light and the film also needed another relationship to contrast the main one between the characters of Tommy and Jennifer, which is not going great in the film. I wanted a positive loving relationship to balance out the one that was falling apart. It’s not heavily featured in the film, but Lesley and Andrea’s relationship gives us a bit more as the film progresses. When I was looking to build up Lesley more and build a relationship into her story I considered a few options. This is the sort of thing where you really start to see where you got lazy when writing. I knew some things about Lesley, but I realized as I was approaching giving her a relationship, I did not know much about her. In too many scenes she was there to give Jennifer someone to talk to. She didn’t have any actual on or off screen conflict to deal with. Developing the relationship, even for as little as we see it, enhanced the story in other ways. This gave me the opportunity to also correct some lack of representation in the film. I chose for Lesley to be a Lesbian. It’s not much at all as far as LGBTQ representation in front of the camera in the film, but I wanted to correct that we had none, which doesn’t really reflect my experiences in life. I’ve always had friends in those communities. The other gap in representation was we didn’t really have any women of color. So, I made a point of seeking out a woman of color for Andrea. I’m thrilled that this lead me to Rory as she is wonderful in this role and we’ve worked together on a few smaller projects since. Lauren A. Kennedy, Sarah Schoofs, and Rory Lipede as Lesley, Jennifer, and Andrea in a group shot in a bar that appears in the background of scenes in Lesley and Andrea’s apartment. I think that it’s a good idea to look at the supporting characters and ask these questions about them and see how much developing them more can help the film overall. I think anyone can get hyper-focused on their main characters and the main plot and lose what these other characters are bringing other than how they help move the main plot along. Those decisions, even when the results don’t take up much time on screen, can help make the story’s world feel a bit more full just by virtue of the audience feeling like there may be/have been something happening off screen with other characters that affects how they impact the main plot. It also leads to adding other subtle natural touches to dialogue in revision, because you know more about that person and the way they might say something. Another fun thing this gap brought to the table is the Wotan Skald Lager brand beer which appears throughout the film and the commercials for the beer which are also pervasive. This did not exist in the script. I made the bottles so I wouldn’t have to deal with a real brand. Also, this allowed me to incorporate the ouroboros around the celtic knot tree of life symbol, which has been appearing or has been some how referenced in most of my personal projects shot between 2012 and 2015. I created the symbol for Abel and Cain, which also features Tara Cioletti and Alex Bone. I didn’t have the idea for the commercials quite yet, but I maybe had a notion. I’ll dive into that in a future post. Finally, the gap also was a little longer than originally intended because we had some scheduling miscommunications. Not the last time we’d have these kinds of issues for the shoot. For a no budget shoot it will happen. It will also really upset you. Perhaps disproportionately to the actual miscommunication. One thing that’s important to keep in mind is that usually there’s a good reason, even if people don’t immediately tell you what it is. It’s very hard not to get upset. Making a film is a very emotional process. It’s a very very stressful process. Get upset, but let it go as soon as you can and get back to work. There’s too much to do and even when it feels like you’re alone in those moments, you’re really not. If you’re working with good people you like and trust, they have your back. They care about the film getting made. They will help. Sometimes the rest of life has to be more important first. Always try to come back to that. Even when it’s hard. In the next post we’ll look at Days Three and Four of Production.